MAC’s holiday 2018 collection is based around metallics, shimmer and colour. There are a huge variety of products in the collection, from an advent calendar, lip scrub/lip colour sets, Fix+ sets, glow sets, retro matte sets, lip kits, face compacts, eye sets, brush sets, extra dimension skin finishes, single eyeshadows (featured here), single dazzleliners, single lipsticks and single lip glasses. Those are a lot of products! You can see the full range on the official MAC website here. The products in the collection look stunning, from the packaging (uber shiny! ), the shades, to the products themselves. There are some bargains to be had through special sets featuring products such as Retro Matte Liquid Lipcolours, mini versions of permanent lipsticks, Liptensity Lipsticks and Fix+ sprays. Whether you choose to look at the products for presents or as a treat for yourself, there are some amazing items on offer. 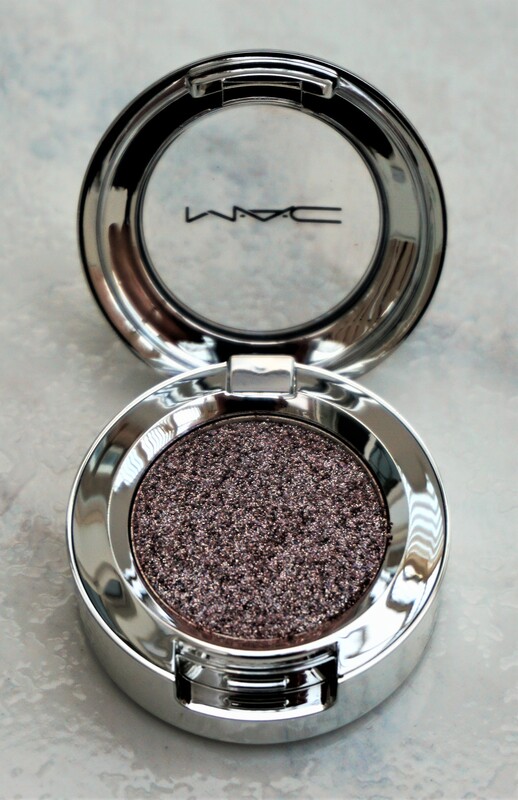 The Shiny Pretty Things Eyeshadows come in MAC’s standard eyeshadow cardboard box shape. 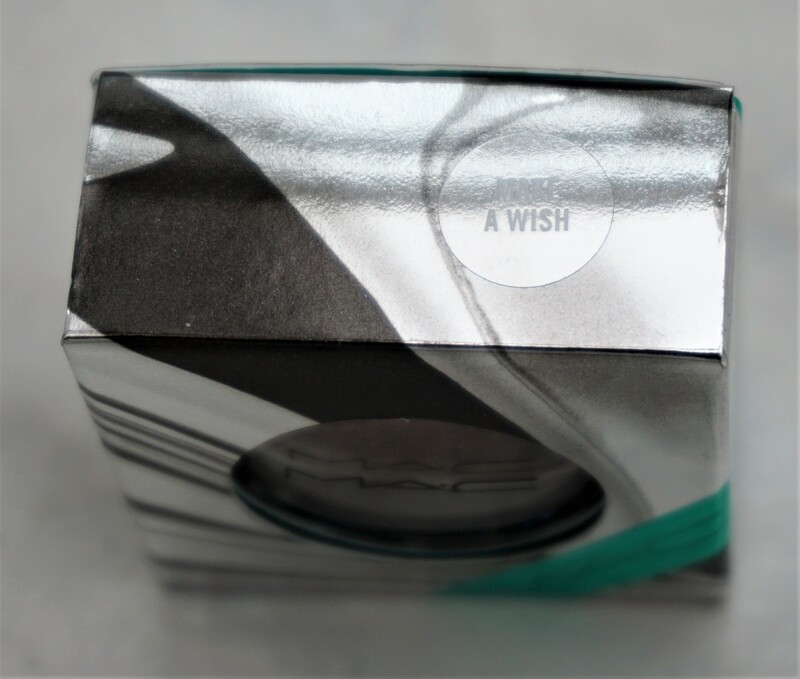 The boxes have a shiny, metallic like silver and black swirled design, rather than the regular black colour. 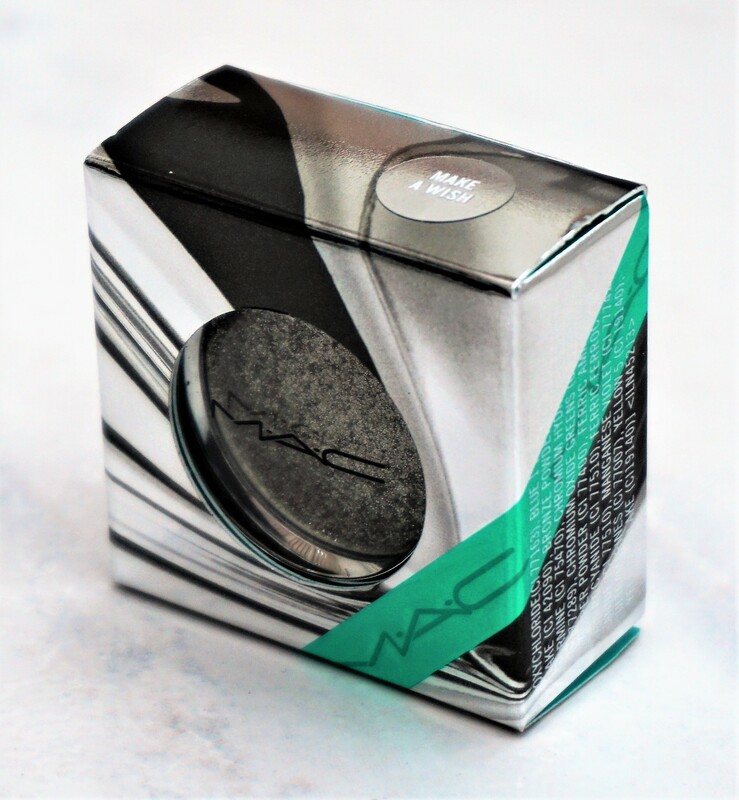 There is a green ribbon style strip across the bottom front part of the box with the brand name, along with a space in the middle to show the eyeshadow encased inside. The tops of the boxes provide the shade name of the product inside on a little sticker. 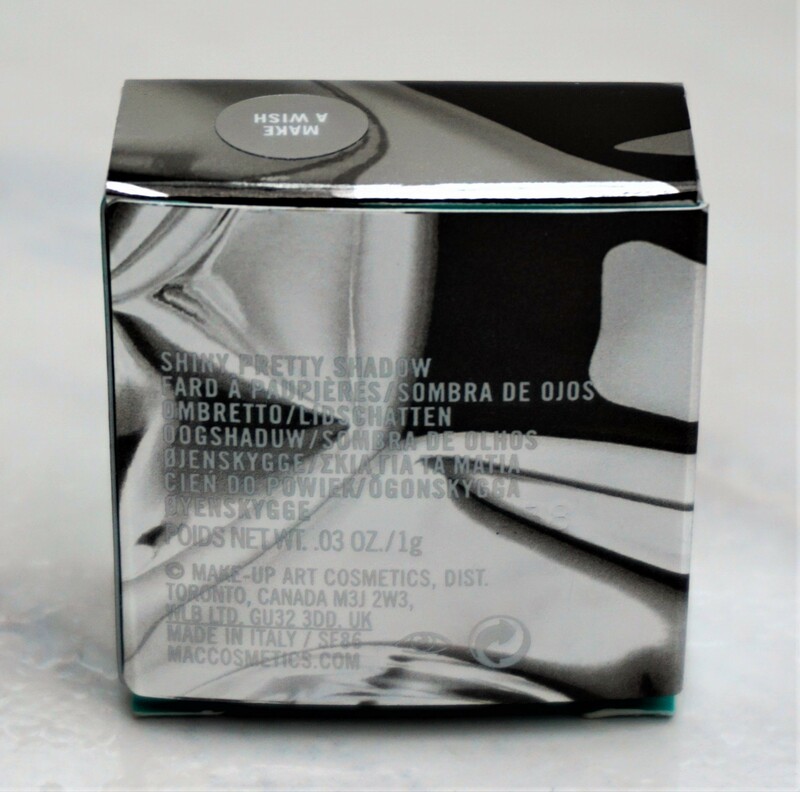 The backs of the boxes have the same shiny silver and black swirled design, with the product name and net weight (0.03oz/1g) printed in white lettering. 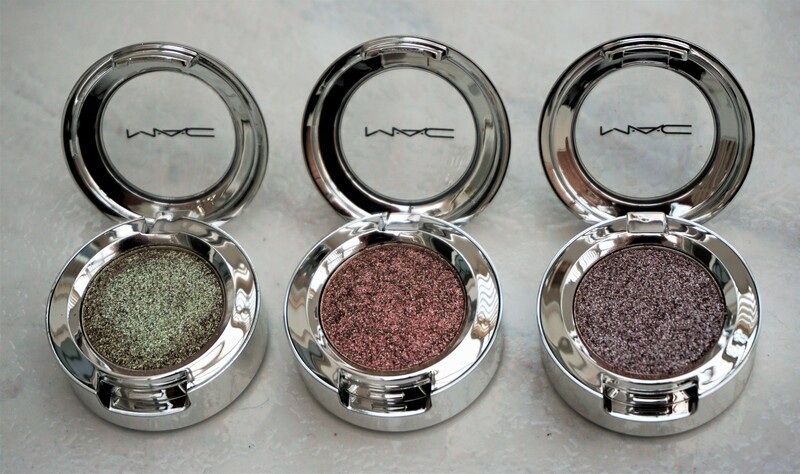 The Shiny Pretty Things Eyeshadows come in MAC’s standard plastic eyeshadow pots. The pots have a shiny silver, metallic style plastic casing instead of the regular black colour. There is a small clear window at the front which shows the eyeshadow colour inside. 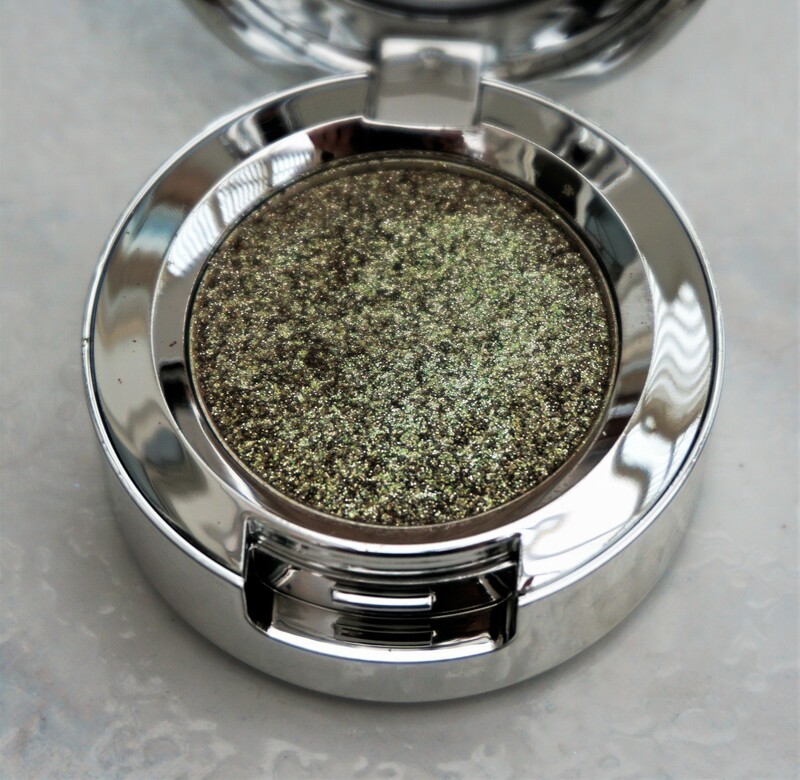 The bases of the eyeshadows have a round sticker (as standard with MAC products) providing the shade name, product name and product net weight (same as above). 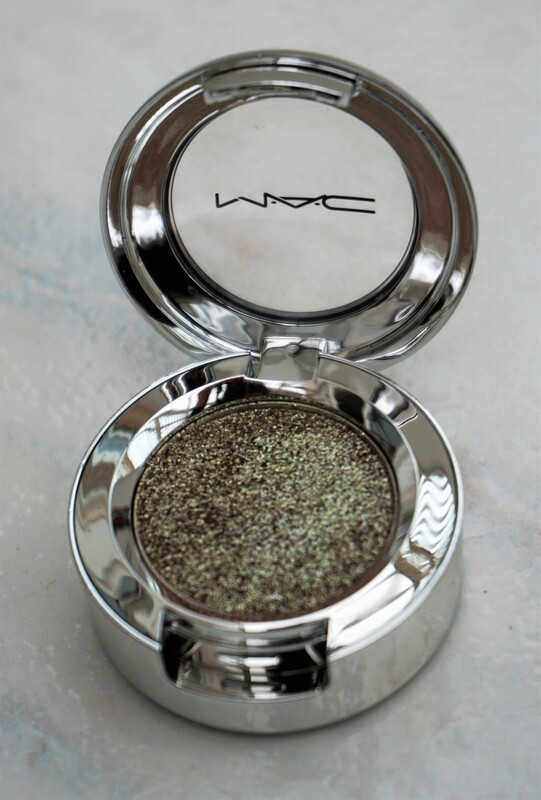 The official MAC website describes the products as being “A total glitz blitz: high-intensity, ultra-saturated, pressed glitter eyeshadow”. The eyeshadows are claimed to contain “A mix of glitter, shimmering pearls and glittering glass bead pigments [to] create the look of endless shifting depth and dimension”. 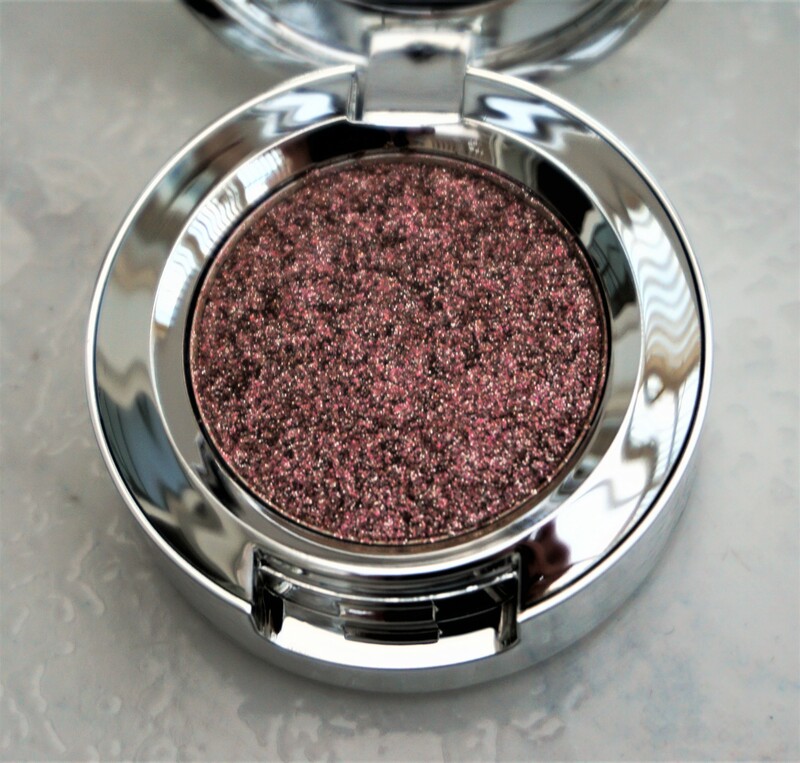 The Shiny Pretty Eyeshadows have the most incredible glimmering, multi-faceted and opaque finish I have seen in an eyeshadow! I sometimes find that glitter-based or sparkly eyeshadows don’t gleam quite as much on the eyes as in the pan but these ones look incredible! The shimmer looks almost wet and sparkles intensely on the eyes. The finish really does give the eyes extra dimension and brightness. One of the aspects I love about these eyeshadows is that the colours are quite complex, giving them a really multi-faceted look on the eyes. There seems to be a base shade (gold, silver, pink, rose, bronze) to each eyeshadow which underpins the glitter and sparkle. There is a real mix of tones and sparkles mixed into each base shade, which makes a number of different colours and tones come through. It makes for a really interesting and stunning effect on the eyes! These eyeshadows apply true to form without me having to spritz my brush with a setting spray or water before application on the eyes. I normally find glittery eyeshadows benefit from a dampened brush as it helps the pigments come together more effectively and ensures a more intense finish. It is amazing to find a glittery eyeshadow which doesn’t need any helping hand; I can just pat it on with my finger or a brush and that’s me done! The eyeshadows last extremely well on me and with minimal fallout. It’s great to find a glitter-based eyeshadow which looks just as good at the end of the day as when I first applied it. There is a very tiny amount of fallout after application but I find that this can easily be brushed away with a clean make-up brush. 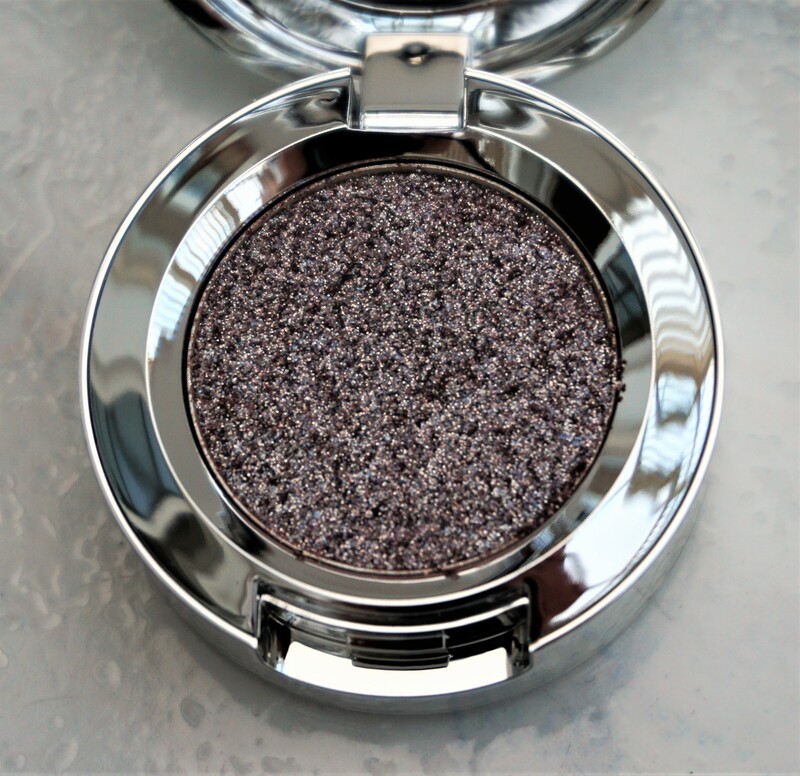 You can find more tips and tricks on minimising eyeshadow fallout in my article here. The official MAC website suggests applying the Shiny Pretty Eyeshadows with fingers. I’ve tried applying the eyeshadows to my lid using a brush and my finger to see how the different methods compare to each other. A stiff, flat shader brush (like a MAC 239 or MAC 242) works effectively at depositing the eyeshadow on to the lid. I like to use a packing, patting motion as this method distributes the product evenly. Using a clean finger to pat the eyeshadow on the lid works effectively at distributing the product evenly and intensely. If you want the most saturated, high intensity level of coverage, then I highly recommend using a clean finger to pat the product on. This seems to be the best way to get a fully opaque application of eyeshadow on the lid quickly and evenly. The eyeshadow seems to transfer extremely well from the pot, to the finger, to the lid with this method. If you want a glitzy finish but a little less full coverage, then a brush works extremely well. I find I need to go back in to the pot and touch up in sections when I use a brush, as the eyeshadow doesn’t look quite as high impact on the lid. You do get an amazing level of coverage, glitz and shimmer; it just isn’t quite as high impact as when you use your finger. I like to apply the eyeshadows over a cream-based eyeshadow primer (like a MAC paint pot) as I feel it gives the product something to cling to more effectively. The product seems to adhere extremely well to the lid when I apply it over a paint pot. You could possibly still use any other eyeshadow primer as a base, as the eyeshadow pigment seems to hold together well. It’s worth experimenting and seeing what works best for you. 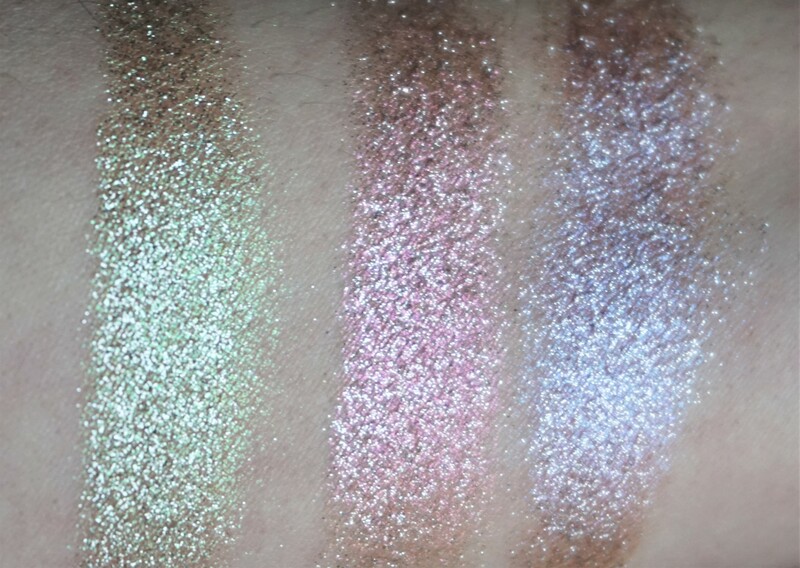 There are five shades of Shiny Pretty Eyeshadows available as part of the collection. The shades include: Just Chilling (a shimmering greyish-silver), Joy To (a cool toned, silvery-pink, grey-brown), Major Win (a gold, pink, copper tone), Make a Wish (a tarnished gold, green, olive shade) and P For Pink (a rose gold with silver). I ended up choosing three shades: Make a Wish (the first one I purchased), Major Win and Joy To. The three shades I chose were completely different to anything that I have in my collection. The other two shades were beautiful too but I thought three was enough for me at the moment. Make A Wish has a gold base with green, olive and gold sparkles. I have combined this shade so far with neutrals (MAC Texture and MAC Embark) in the crease. I can imagine it looking amazing with greens, golds, purples and even blues. Major Win has a warm, light pinkish-copper base with gold and pink sparkles. I have worn this shade so far with cranberries and deep burgundies (MAC Cranberry and MAC Sketch). I think it would also work well with purples and browns. Joy To is has a cool silvery-taupe like base with silver, lilac and pink sparkles. I have combined this shade so far with purples (MAC Haux and MAC Blackberry). I think it would look really pretty with browns, charcoal greys, pinks and purples. The Shiny Pretty Things Eyeshadows cost £16.50 and are available from MAC counters, Debenhams, House of Fraser, Selfridges, ASOS and Look Fantastic. The eyeshadows are limited edition, so it’s worth checking them out if you think you might like them. 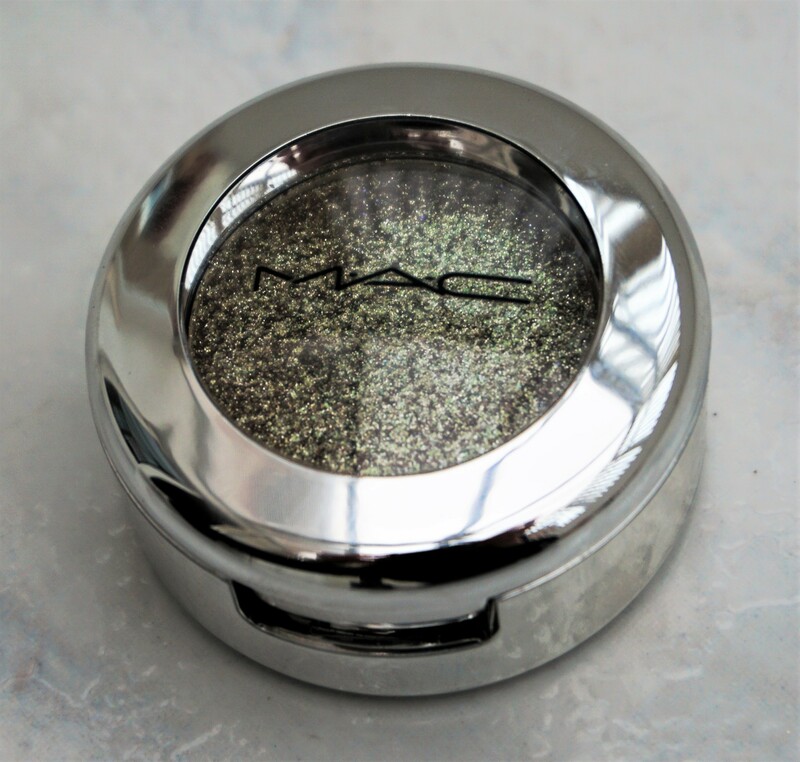 Have you picked up any of the MAC Shiny Pretty Things Eyeshadows? What do you think of them? Any combination ideas? 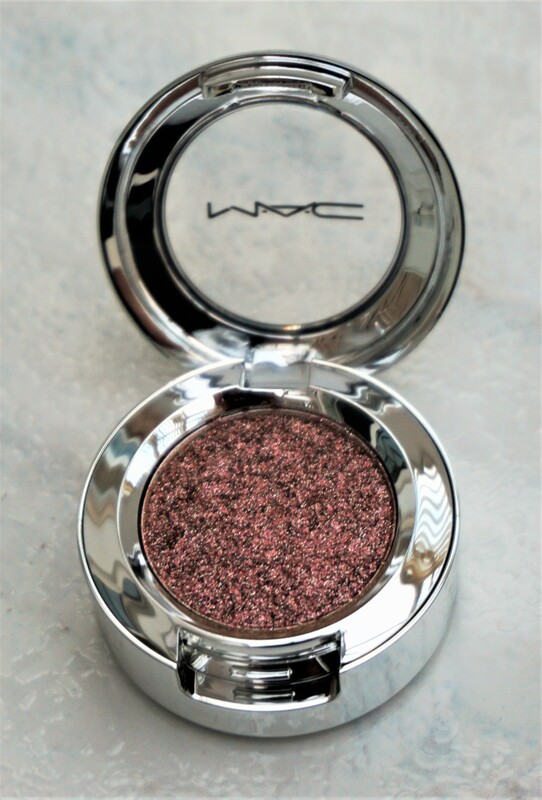 Or have you picked up any other items from the MAC Shiny Pretty Things collection? Let me know in the comments section below.